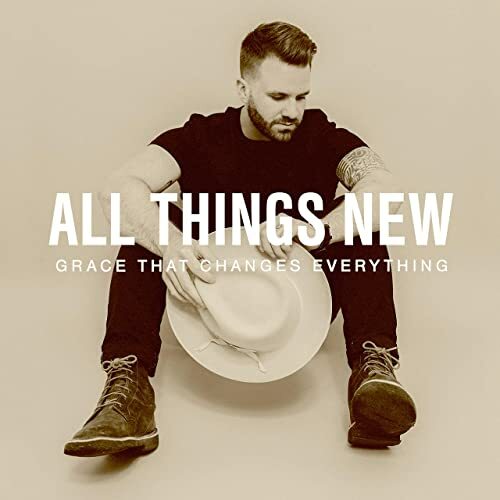 One of the bands that I instantly took a liking to when they debuted their first album a few years ago was All Things New– with their hit single “New Man” speaking about how we as Christians are new men and women in Jesus, and we don’t have to live otherwise anymore. The song was freeing, the album was refreshing, and by the time the second album The Good News released in 2015, I was hooked and eagerly anticipating more music from lead singer Garrett Hornbuckle and his friends. Their sophomore album didn’t disappoint also, with songs such as “Believe” and “Can’t Hold Me Down” solidifying their imprint in CCM. Then the year after, after posting pictures of the band in the studio recording their third album, All Things New suddenly faded away. And I wasn’t sure what happened…until now. Similar to how Stars Go Dim has been ‘reborn’ with just Chris Cleveland, and Rhett Walker Band with just Rhett Walker; so too has All Things New with Garrett Hornbuckle. And as I quote verbatim a post on Facebook from the band; we can see that All Things New has the same message and heart as they did way back when they first started- and the new single “Grace That Changes Everything”, penned by Matthew West, looks to ensure that All Things New once again places their music firmly in our hearts, and never allows us to let go. All Things New is an old band reborn. Although the group began their career ten years ago, who you see now is not who you saw when they first began. In 2016, as the four-piece prepared for another national tour, three of the band members abruptly stepped down, leaving Garrett Hornbuckle completely blindsided. What Hornbuckle learned was that although the stage offered a platform to amplify God’s goodness, it also offered a platform to amplify his insecurities. His identity was dictated by fame, and the way he led his band became less about God’s kingdom, and more about his own. The sudden dissolution of the group was staggering, and although Hornbuckle wanted to rid himself of all things music; he’d made commitments he had to keep. The next year was humbling and metamorphic, and it changed the trajectory of his life. All Things New dissolved as a band and transformed into a ministry. Now, years later with a supportive wife and a newborn daughter by his side (and all three former band members rooting him on), Hornbuckle’s investment is in proclaiming the gospel across the nation. He leads worship at various churches, encourages and coaches worship teams, and reminds everyone he can that there’s newness in Christ. When he isn’t singing for a congregation, he’s writing music with a new outlook—to build the only Kingdom that matters. All Things New is now a one-man band in every sense of the word, but don’t let that fool you into thinking that this new incarnation isn’t any good. Because Garrett’s effort here is nothing short of remarkable considering everything he’s been through this past year and the journey he’s been on. It almost makes the song ironic that it’s about grace, which Garrett needed to fully grasp and accept in order for this new version of the band to move forward into where God was and is moving them towards. Grace is a concept that we all get and understand in our heads, but seldom do we sit and wrestle with the concept if things don’t make sense. And as Garrett eloquently proclaims in the chorus that ‘…now I’m forever changed, by the grace that changes everything…You washed my sins away, now my rescued soul will ever sing of the grace that changes everything…’, we are presented with a glimpse of an understanding of what grace is and what grace does. It’s God’s gift to us so that we can be made whole and one with Him. It’s a gift so that we can have eternal life, and a gift that we don’t deserve, but God gives out anyway. And once we realise that it’s God’s grace that covers us every day and makes us blameless and spotless in Jesus’ eyes; then our lives can truly be lived in freedom and to the full. While I’m not sure as to what Garrett will do next in All Things New with regard to a new album- we know he is touring with Sidewalk Prophets soon- I guess what happens next doesn’t really matter. Jesus showed up in Garrett’s life when everything was crumbling around him and gave him a new perspective and something else to focus on to bring Him glory. Grace changed the trajectory of Garrett’s life from one of confusion and despair to one of joy, celebration, new life and hope. Now that is something to sing praises about! So now as we dwell upon the grace that changes everything, let us listen to this new track with the appreciation that a new song doesn’t need to lead to an album, given that this moment is enough- we are capturing a moment in time when Garrett is undoubtedly secure in his identity as a child of God and a musician. Well done Garrett; can’t wait to hear what is next from you!